Perhaps the most significant business decision Ive made since starting online in 1999 is to offer a coaching program. It has, literally, doubled and even tripled my income. * It takes 50 customers buying a $20 ebook to earn $1,000. 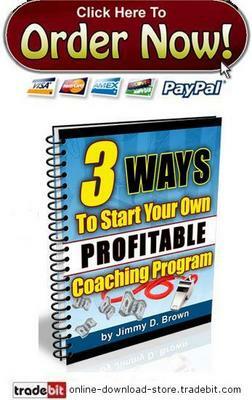 * It takes only 1 customer buying a $1,000 coaching program. You can make a lot more money with a lot less effort by simply offering something with a greater price tag in this case, your own coaching program. Years ago I heard a speaker (sorry, cant remember who it was) talk about high-dollar coffee grinders sold at Starbucks®. His point was clear: while not everyone buys the grinders, when one is sold it significantly increases profit. You gotta sell a lot of cappuccinos and lattes to equal the same profit from a grinder. It was at that moment that I started working on (and eventually launched) my own Six-Figure Formula coaching program. I still offer it about 3-4 times per year and it brings in close to $100,000 just by itself. but because you are interested in you and what you can do. Quite simply: If you are willing to invest just ten dollars, Ill explain some things that Ive done - which you can do - to launch a successful coaching program. * The ultimate coaching model that youll probably think it cant be that easy, no one will pay for that at first glance ... until you see how 50 students pay me $197 per month! * Why coaching is not simply trading your time for money - in fact, as I disclose in this report, many pay for coaching and rarely even interact with their coach. * My sneaky method of launching a coaching program EARLY so you can get paid much quicker than ever before ... in fact, Ill give you TWO ways to take this shortcut! * A big, big mistake that most people offering coaching programs make (especially those launching their FIRST program ... although I have seen pros do this too!) and how you can avoid it with one little change. * A 5-step, process for becoming a C.O.A.C.H. in your own high-ticket coaching program ... includes a simple overview blueprint for establishing your program. * Your #1 best option for running your coaching program ... this blows away what most people are using with their coaching and will simplify (and greatly improve!) the ease and success in which you conduct your interaction with clients. This report is just that ... its a report. Its not some comprehensive, systematic course that teaches you how to get started from scratch with no skills or abilities and develop your own empire. If you are looking for something like that, you are in the wrong place. This is a 13-page report available for instant download at an incredibly low price only $1.90! Dont expect a degree in coaching as if this was some kind of collegiate course. Its not. To be sure, its jam-packed with exactly what Ive told you is in it. And its worth easily 5X what Im charging. But, if you are expecting every detail to be explained at great length, dont buy. Its not for beginners.